Neil McRoberts is demanding improvements from Portsmouth despite their unbeaten start to the season. The Rugby Camp outfit travel to Teddington in London three south west on Saturday. Portsmouth have opened their campaign in barnstorming form following three successive victories and sit third in the table. Nevertheless, McRoberts still feels his troops can get better in possession and wants to see that at Teddington. The senior coach said: ‘Teddington will be a typical London team – young and looking to play open-running rugby. ‘We can play that game too but must make sure we do it on our terms and not theirs. ‘The key is focusing on our game and improving one or two areas. ‘We need to be more accurate when in possession and when we go into contact situations. 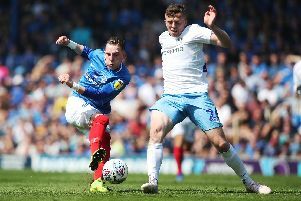 Portsmouth are boosted by a first appearance of the season for Elliott Worrall. The number-eight forward has been playing National League rugby with Worthing and McRoberts feels his experience will be key. ‘Elliott is a big strong unit and gives us extra impetus with his ball carrying,’ added the coach. ‘He is also good at the base of the scrum and in the line-outs. Meanwhile, Havant are looking for lift-off as they make the short trip to Chichester in London one south. Five successive away defeats have left Will Knight's side one place from the bottom of the table. With the club’s new artificial pitch at Hooks Lane nearing completion, Havant are desperate to chalk up a first victory on the road. Chichester are also without a win so far this term, meaning there’s a lot at stake for both teams. Petersfield travel to Old Georgians optimistic they can pick up a maiden London three south west win of the campaign. The Reds have necessary fire power to hurt their rivals but must add clinical finishing to their repertoire. Southsea Nomads entertain Havant III at Furze Lane in Hampshire two.